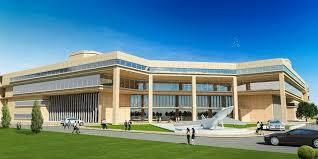 The Foundation Stone for the Integrated Office Complex of Director General of Civil Aviation (DGCA), Bureau of Civil Aviation Security (BCAS), Airports Economic Regulatory Authority of India (AERA), Aircraft Accident Investigation Bureau (AAIB) & Airports Authority of India (AAI ) was laid by Shri. P. Ashok Gajapathi Raju, Hon’ble Union Minister for Civil Aviation today at Safdarjung Airport in august presence of Shri. Jayant Sinha, Hon’ble Union Minister of State for Civil Aviation, Shri. R.N. Choubey, Secretary, Civil Aviation, Shri. S. Machendranathan, Chairman (AERA), Shri. B. S. Bhullar, Director General, DGCA, Shri. Kumar Rajesh Chandra, Director General, BCAS, Shri. Bir Singh Rai, Director General, AAIB and Dr. Guruprasad Mohapatra, Chairman, AAI. To be constructed at an estimated cost of Rs. 303 crores, this Integrated Office Complex will serve a long felt need of an office for all the aviation regulatory authorities under one roof and in close vicinity to the Ministry of Civil Aviation (MoCA) for better coordination. With total built up area of 70,940 Sq.m., the proposed Integrated Office Complex will be a three storeyed building and would accommodate the total requirement upto 1500 personnel. The building will be designed with sustainable green and eco-friendly features and will have roof mounted solar panels, energy efficient lighting, rain water harvesting system, zero waste discharge and use of daylight with glass façade. Beside this, the central courtyard of the building will have unique horticulture features providing shaded areas. Every room will have the view of landscaped courtyard and surrounding greenery providing a congenial environment for the workforce. Implementation of this project has been entrusted to AAI.